I started with a pre-poo treament. The coconut/olive oil mix was applied on my hair and the black castor /peppermint oil on my scalp. I used hot water to warm up the coconut/olive oil mix. Since last week I have been using Organix Repairing Awapuhi Ginger. So far this shampoo is oke, but I’m not sold yet. After the wash I did a quick conditioning treatment with Redken Time Reset conditioner. In section applied the product on my hair. After 5/6 minutes I rinsed it out. After drying my hair with a t-shirt I applied Nexxus Humectress Ultimate Moisturizing Conditioner mixed with macadamia, rosemary and peppermint oil. I deep condition with heat for 50 minutes. After that I let my hair cool off for 20 minutes. Lately I don’t know what to do after a wash. I’m planning to stop with air drying for a while, but as usual I went for the air dry method. I used Creme of Nature Argan Oil Strength & Shine and Olive Oil & Mango Butter Leave-In H2 Conditioner. I sealed my hair with John Frieda Frizz Ease serum and then styled my hair in a high bun. For the past 4 weeks I have been wearing my u-part wig with a closure. Hahaha let me tell you .. I was so afraid for the closure. I bought the closure last year in March and I finally decided to use it. I will write a post about how I maintain my hair with a u-part wig. When I do this protective style I make sure that I was my hair every two weeks. So yesterday was time for a wash. 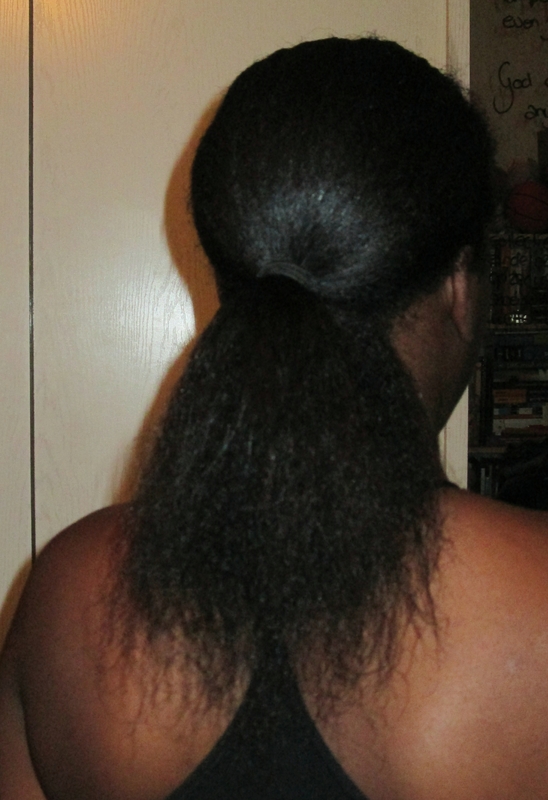 When I was taking down my braids the hair loss was minimal, but I was afraid of detangling my hair. So when I took the braids down I let my scalp rest. Lool it felt like my scalp was gasping for air. Step  Before my wash I wanted to do a protein conditioner treatment, but I was lazy as always. So I decided to use Salerm Protein Shampoo. I washed my hair in 8 sections, yes 8 sections , because my scalp was sensitive. Step  I used a t-shirt to dry my hair. Because of the protein shampoo it was necessary to use a good moisturize conditioner to give my hair a boost, that’s why I used Nexxus Humectress Ultimate Moisturizing Conditioner. 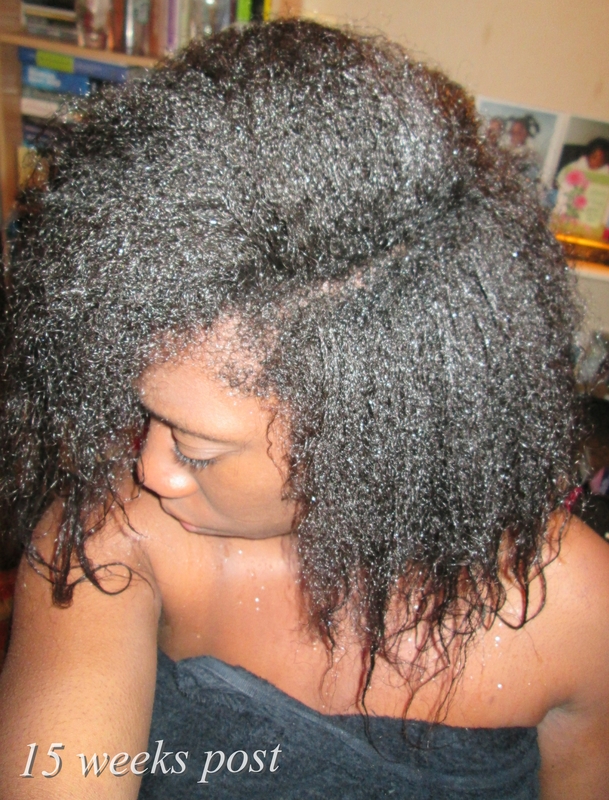 After the wash my hair was so stiff, but as soon Nexxus touches my hair, I am on cloud 9!!! I was a bit sad when applying the conditioner, because my hair was shedding. Mind you I still haven’t detangled my hair. I deep conditioned my hair with heat for about 30 minutes and let it sit for a hour (I was busy watching Mob Wives lool). Step  After I rinsed out the conditioner, I didn’t do much with my hair. I t-shirt dried my hair for some minutes and then applied Garnier Fructis Repair leave-in. After that I put my hair in high ponytail and let it air-dry. Step  In the morning, it was time to moisturize and seal my hair. But there was a problem. I finished my ORS hair lotion & Elasta QP Olive oil & Mango butter and haven’t restock them yet. I need to go to the store ASAP!! But I had a plan B, thank God. I mixed my Herbal Essence ‘Hello hydration’ with Rose water. This mix really helped, it softened my hair and it really helped with detangling my hair. Step  After moisturizing my hair I styled my hair in a low ponytail, but my edges was looking crazy. To get my edges sleek I applied Fruit of the Earth Aloe Vera gel and put a scarf on it. 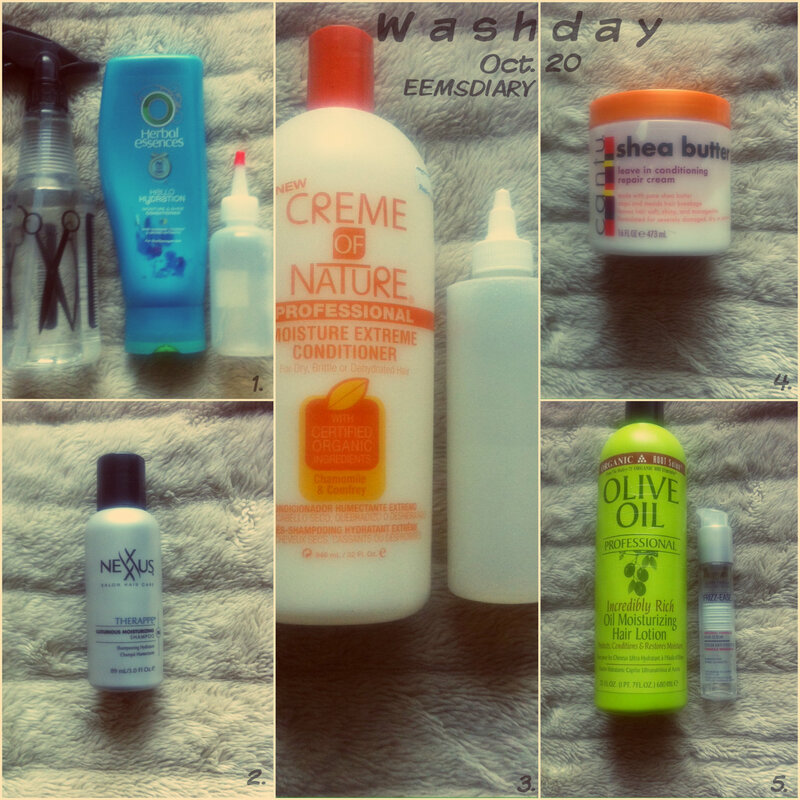 [A] every time I start with my wash routine, I make sure that my hair is detangled. I do my detangle method in four parts, it’s easier for me that way and less damaging to the hair. 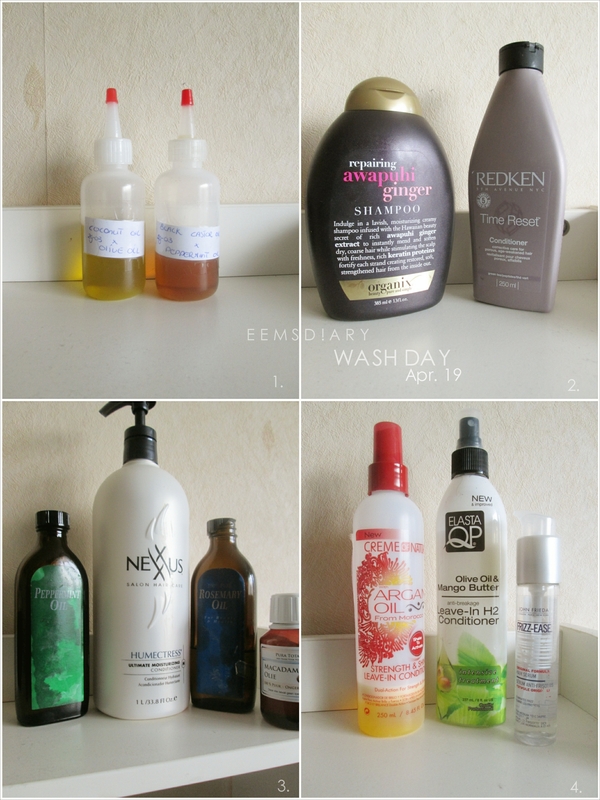 [B] Each part I apply my oil pre-poo mix first, then I put some oil on my scalp and massage it. To make the treatment complete, in small sections I apply the pre-poo mix. I made sure that I gave my problem areas (nape, edges and ends) some extra love. [C] I cover my hair with a plastic bag and sit under the dryer for 30 minutes. 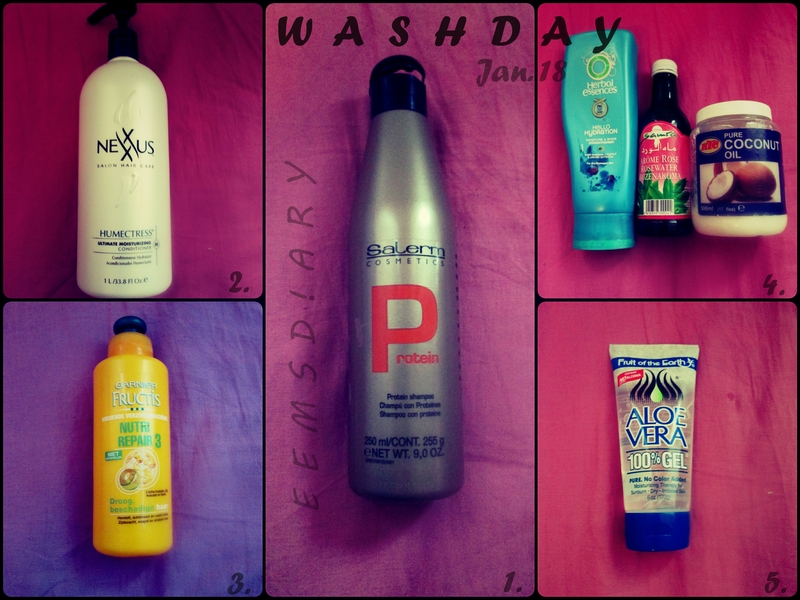 [D] My wash routine is so simple and short. 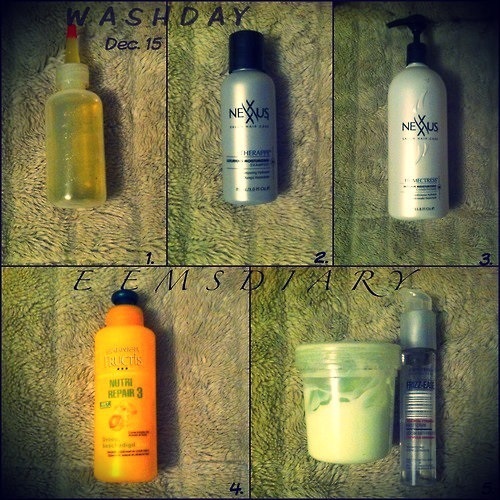 For this wash I used Nexxus Therappe Luxurious Moisturizing Shampoo. I can’t wait to finish this bottle, I don’t like it. It’s supposed to be a moisturizing shampoo, but I don’t agree. Because I don’t like this shampoo I only washed my hair once, normally I wash it twice. [E] After the wash I cover my hair with a cotton t-shirt for about 20 minutes to soak up the water. I applied Nexxus Humectress Ultimate Moisturizing Conditioner on each section, covered my hair with a plastic bag and sat under the dryer for 45 minutes. What I love about this conditioner is that you don’t need a lot of product. I didn’t mix this conditioner with an oil. It’s the first time that I use the shampoo and conditioner together. Let’s see how that will work out. Oke so after washing my hair I wasn’t happy. My hair was moist from the conditioner but my hair was still stiff from the freaking shampoo. I was extra gentle with my hair while rinsing out the conditioner. [F] I applied Garnier Fructis Repair leave-in all over my hair. Normally I will apply the leave-in in small sections, but I’m lazy. I concentrated on my ends, nape and edges. [G] After applying the leave-in I let my hair air-dry. [H] In small sections I applied my moisture mix (ORS Hair Lotion x Rosewater). For sealing I used John Frieda Frizz Serum. My hair wasn’t 100% dry when moisturizing my hair. The rest of the air-drying was overnight. Nexxus Therappe Luxurious Moisturizing Shampoo is not my friend !!! Like 3 weeks ago I finally ordered pH Indicator Strips online. For the readers who are thinking pH strips?? For what? ?. Well it’s important to know what the pH balance of a product is. Why?? I started my wash day with a pre-poo. I really need to stick with my weekly pre poo treatment. For my scalp I used an oil mix (castor + peppermint oil). On my hair I applied Herbal Essence ‘Hello Hydration’. Before applying the conditioner, I sprayed my hair with water, just to make my hair a bit damp. I really like this conditioner for a pre-poo and co-wash treatment. I pre-pooed my hair for 30 minutes without heat. I used Nexxus ‘Humectress Ultimate Moisturizing shampoo’. This is my 3rd time using this shampoo and to be honest I don’t find it moisturizing. It does make my hair soft, but I can’t connect on the ultimate moisturizing part. Shedding problems ughh !!! Since my relaxer my hair is shedding more than it normally does. I know that I need to do more protein treatments, so I’m going to work on that. Pre-poo: on my hair I used Organix Moroccan Argan Oil conditioner and for my scalp I used an oil mix (castor + peppermint oil). I pre-pooed my hair for 30 minutes without heat.